Here is one of the great mysterious works of man, as great and mysterious as a cathedral. And what did you do? You gave it so little of your real selves that you actually achieved bordeom. You stood in Chartres cathedral unmoved. . . . This is not a matter of grades. You’ll slide through all right. It is not bad, it is just flat. It’s the sheer poverty of your approach that is horrifying! But the more I’ve thought about that moment and my reaction, the less satisfied I am–not with them (though come on, it’s “The Dead”! ), but with myself and with the unfair lose-lose situation I am (silently) putting the poor students in. People who want to become English professors do so because, at one point in their lives, they found reading a story, poem, or play to be an emotionally rewarding experience. They somehow, someway were touched by what they read. Yet it is precisely this emotional response that the would-be professor must give up. Of course, the professor can and should have those feelings in private, but publicly, as a teacher or publisher, the professor must talk about the text in nonemotional, largely technical terms. No one ever won a National Endowment for the Humanities grant by weeping copiously for Little Nell, and no one will get tenure in a major department by sharing his powerful feelings about Housman’s Shropshire Lad with the full professors. While we can all share a shudder at the very idea, to me one strength of McCrea’s discussion is his admission that marginalizing affect, pleasure, and aesthetic response is, in a way, to be untrue to literature, and that the professional insistence on doing so also, as a result, marginalizes our conversation, alienating us, as McCrae says, “from our students, our counterparts in other academic departments, our families [unless, he allows, they include other professional critics–otherwise, as he points out, even they are unlikely to actually read our books and articles], and, ultimately, any larger public” (164-5). (In Democracy’s Children, John McGowan makes a similar point: “There remains a tension between the experience of reading literature and the paths followed in studying. . . . To give one’s allegiance to the academic forms through which literature is discussed and taught is to withdraw [at least partly] allegiance to literature itself” ). They aren’t standing in Chartres cathedral unmoved. I’m slamming the door of Chartres cathedral in their face. They might well have been feeling all the excitement I could hope for, or at least those who actually did the reading for the day might have. But it wouldn’t be their fault if they thought the CIBC Auditorium was no place to bring it up. It wouldn’t be Mark’s fault either, or mine. We do show enthusiasm and appreciation for the literature we’re covering, to be sure, but it’s not of the viscerally rapturous variety, or even the aesthetically transcendent variety. It’s a heavily intellectualized variety, and while I don’t think that makes it inauthentic, it isn’t something they are quite ready to emulate, not yet. I want them to feel the readings, and to show that they feel them, but there’s really no appropriate way for them to express that feeling in the ways they would find natural. But what are we to do? I’m not a fan of the unreflexive response, and taking down the nets would open up our class discussions (at least potentially) to a particularly banal and subjective kind of verbal tennis (“I really like this” / “Can you say more about why?” / “Not really, I just thought it was nice / beautiful / relatable”). Nobody learns anything from that. I usually just hope that my enthusiasm (however peculiar its variety) catches their interest and makes them read more, and more alertly, then they otherwise would. I try to give them tools to notice and think about their more personal responses, too: how they might have been achieved by the formal strategies of the work, and what their implications might be. I was remembering, though, a conversation of my own with one of my undergraduate professors. We had been reading Matthew Arnold, including “To Marguerite–Continued,” at a time when a lot of emotionally difficult things were going on in my life, and after our seminar (in which, as I recall, we talked about things like faith and doubt, and modern alienation, and verse forms, and metaphors) I very tentatively went up to the professor–one of my favorites, a wry 18th-century specialist who always looked faintly sardonic (as is only fitting, of course, for that period). “But don’t you think,” I remember saying (and those who know me now would not, probably, believe how nervous it made me even to stand there and ask this kind but intimidating man anything at all) “don’t you think that life is like he says? that we are isolated like that?” “Perhaps,” was his only reply–that, and a quizzical lift of his eyebrow. Well, what else could he say? What did my angst have to do with his class? But (I’m full of these equivocations tonight, apparently) I can’t help but think that, for all the gains involved in professionalizing the study of literature, one of the reasons our students don’t graduate and go out into the world and absolutely trumpet the value and significance of the work they did with us is precisely that we have given up that prophetic role. We stood with them outside the cathedral, perhaps, and told them it mattered, and explained its history and architecture and social role and so forth, but left them to stand inside, moved, on their own. To be sure, they might have ignored it altogether if it weren’t for us (how many of these kids would pick up Joyce on their own? ), but no wonder they are left thinking that when it came to the things that really mattered, we weren’t there for them. ‘“The Dead,” which I know I am not alone in finding one of the greatest pieces of modern fiction: smart, patient, subtle, powerful, poignant.’ – Yes, yes! I had an undergraduate professor, an adjunct probably long gone now and not beloved by many. His expectations of us were extremely high, and his devotion to literature absolute. I recall him reading a poem to us that he found so beautiful that it made him weep! And yet, he could still speak entirely intelligently about it. It changed me, but sadly not enough to make me as open as he was in front of students. But I’ve always envied and admired him and wished that my brain and heart could sit so comfortably side by side when engaging with books. What I’m saying is, I empathize with your frustration; it’s one I used to share, when I still taught. But you took at least one student into the cathedral yourself – it’s because of your George Eliot seminar that I took back in my MA year that I not only love 19th-century lit but have also often regretted not making it my doctoral field of study. That is a really horrible classroom. I agree that is not a good space for discussion. Very interesting post, Rohan. I think the issue arises in part because of what we feel ‘study’ must look like to accomplish its aims. Back in the first half of the century, it was the role of the literary critic to write in much more accessible, human, and moving terms about great literature, to try to put the reader in a special place in relation to it. Since the sixties, I suppose, and the commercialisation of education as well as the predominance of the scientific imagination, we simply can’t go there because it seems silly and small in relation to the cold hard analysis of… well, something or other. To weep over our literature would be a very quick way to be deemed futile and unworthy of funding. We would become the emotional, ornamental Victorian ladies of the university, rather than the thrusting level-headed alpha males. For myself I think there is a difference between the emotional response per se, something that happens when we are alone with our memories and feelings and a text, and the profound upheaval that we can experience when we recognise the mastery in a piece of writing, or suddenly see its full implications. I think putting the students in touch with the latter is a good way to approach the job of teaching literature and it is still a spiritual response (in the sense of awakening our awareness of the spiritual as opposed to the scientific side of life) but probably a less visible one. I actually think the prof who you spoke to about Matthew Arnold did you a disservice. That’s a conversation I would certainly have with my students and find very productive. The philosophical implications of a story, the sense of how life is being represented there and how we can discern a certain constellation of personal fantasies behind it that appeal or repulse, is worth pursuing in discussion, I think. I tell the students that their emotional responses are vital and the start of any reading – we go beyond them, but it’s a tougher task to get into a text without them. Litlove makes a good point about the structural pressures that have shifted how we think of literary study (which includes the other issue I know bothers you about “research” as opposed to scholarship). I’m a sociologist, who never quite got English literature (though I’m thinking if I ever took a class from you, I might have had a chance). But the interesting thing that occurs to me when reading LitLove’s comment is that in sociology there has been more of a turn towards issues of the emotional and some serious attempts to capture those in analysis, especially among qualitative researchers. I even know a sociologist who is seriously considering writing in a different style in order to really do justice to some of this material. She began her undergraduate career in a creative writing program and is feeling a need to go back to those roots. Perhaps it is this knowledge of the revolt against scientistic research paradigms in the social sciences that makes me so enthusiastic for the humanities to really claim the full worth of their unique approach rather than falling back on the somewhat minimalist cry of “we teach critical thinking”. Thank you all for these very thoughtful responses. Colleen, you comfort me! And also you help me remember not to generalize about ‘teaching’ generally from one (horrible) classroom. More than that, it’s important for me to remember that just because I can’t see or hear what the students are feeling, it doesn’t mean they aren’t feeling something important and maybe even transformative–and as you say, litlove, that response might well be triggered by appreciation the mastery of a work. Jo, I really agree with you about the impoverished notion of the humanities that is represented in that appeal to ‘critical thinking.’ I think I just have to have confidence that even if it sometimes seems as if I am simply performing my own enthusiasm in front of their more or less disengaged eyes, there’s a lot more to it then that–and in other classes (and better classrooms), especially those that allow for more intimacy and discussion, we get a lot closer to the kind of teaching and learning that I’d like. It is interesting to reflect on how classroom design reflects ideas of education. This particular room is state of the art, in some respects, with lots of technology at my fingertips (when it’s working) and desks and chairs that are all more or less whole and clean. But it’s not designed to promote discussion, that’s for sure. 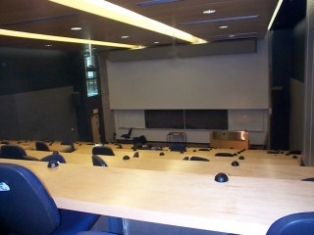 Even the smaller classrooms in our Arts & Social Sciences building (which seat around 40) are sterile, cold rooms, and you have to move the big rectangular tables around to create a ‘seminar’ environment. 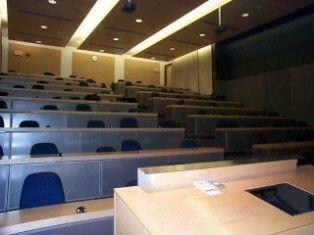 Colleen will appreciate that I sometimes miss the old houses where we used to have our offices and seminar rooms. Cramped, musty, and inconvenient as they were, at least we were all around a table together.